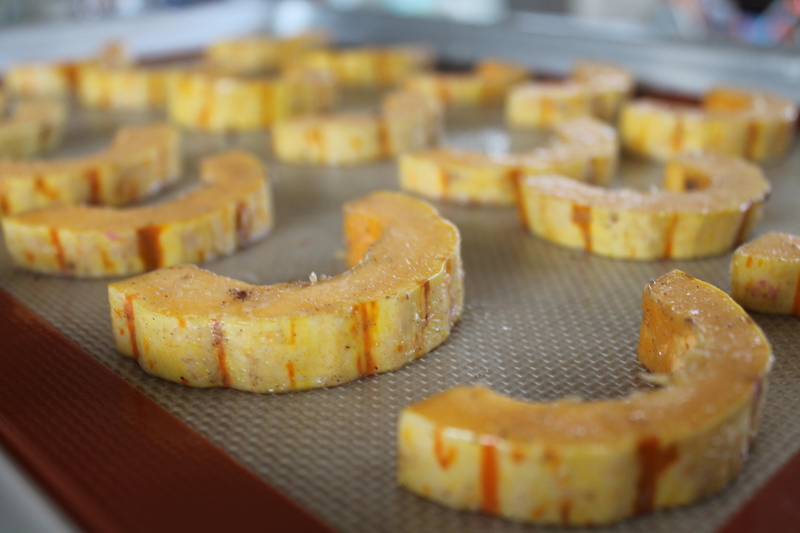 I had kind of hoped to suggest these roasted squash slices in place of candied yams. No offense if candied yams are your favorite thing, but I have always been a little freaked out by adding sugar (marshmallows?) and syrup to sweet potatoes. A lightly spiced, naturally sweet Fall squash seemed like the perfect substitute! This squash is good by itself, but if you have any intention of replacing all those candied tubers on the Thanksgiving table, I highly recommend adding a lightly sweet, cardamom-spiced yogurt sauce for dipping. Still way healthier than candied yams, but it will meet the need for sweet. 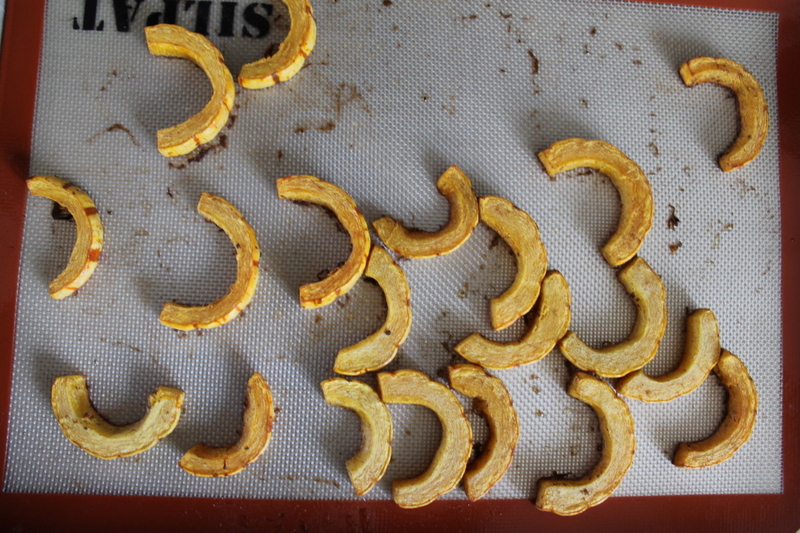 It couldn’t be easier to roast up these squash slices. If you can’t find delicata squash at your grocery store or local farmer’s market, then you can substitute acorn squash—but the skin is a bit tougher, and though you can certainly eat it, you will end up with some firmer textures in there. First, cut the squash in half lengthwise and scrape out the seeds. You can easily double this recipe, but my family isn’t wild about eating their veggies, so I just cooked up one small squash. 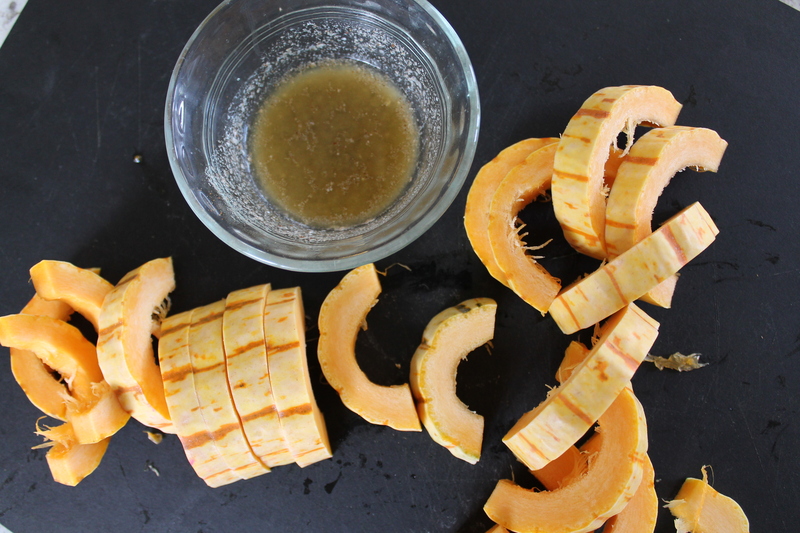 Trim off the ends, then slice the squash into ½″ pieces. Make a quick spiced butter (salted butter, a pinch of cayenne, a splash of vanilla, and cardamom of course!) and toss the squash slices in it. Lay the squash on a lined cookie sheet, not touching each other. If you are into dipping sauces, you can whip up a lightly sweet dip with Greek yogurt, melted butter, a little maple syrup, and a hearty dose of cardamom. 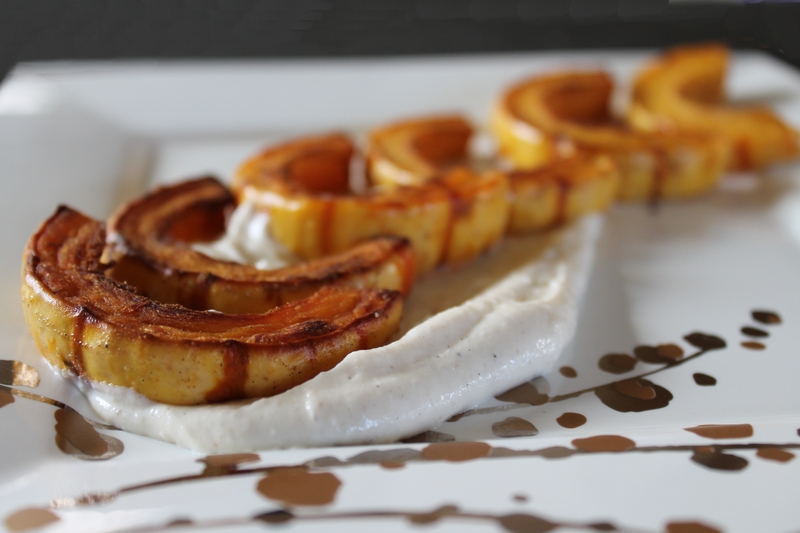 Serve the squash slices warm, alongside your other favorite veggies, or with the yogurt sauce. 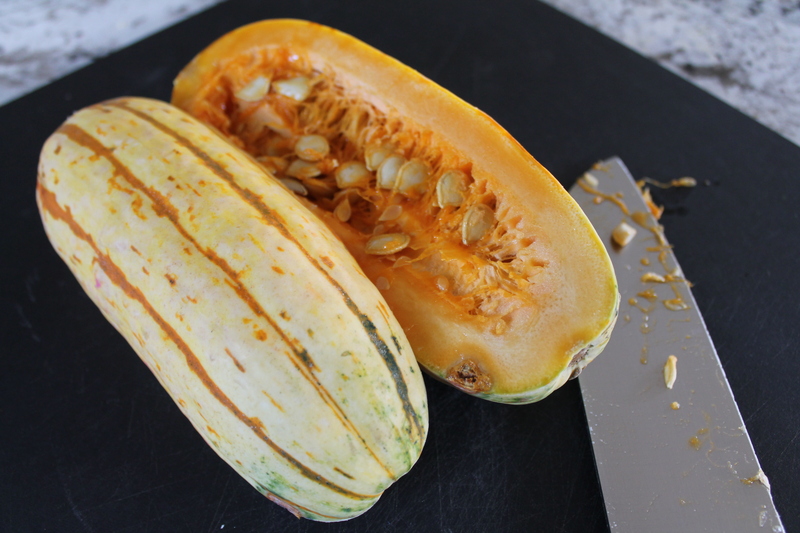 Cut the delicata squash in half through the stem and scrape out the seeds. Trim the ends, then slice into ½″ pieces. Combine 1 tbsp. melted butter, ¼ tsp. cardamom, vanilla, cayenne, and salt in a medium bowl. Add the squash pieces and toss to combine. Lay the squash in a single layer on a cookie sheet. Roast for 30 minutes, until tender and lightly browned. Meanwhile, stir together yogurt, maple syrup, the remaining 1 tbsp. melted butter and ¼ tsp. cardamom. 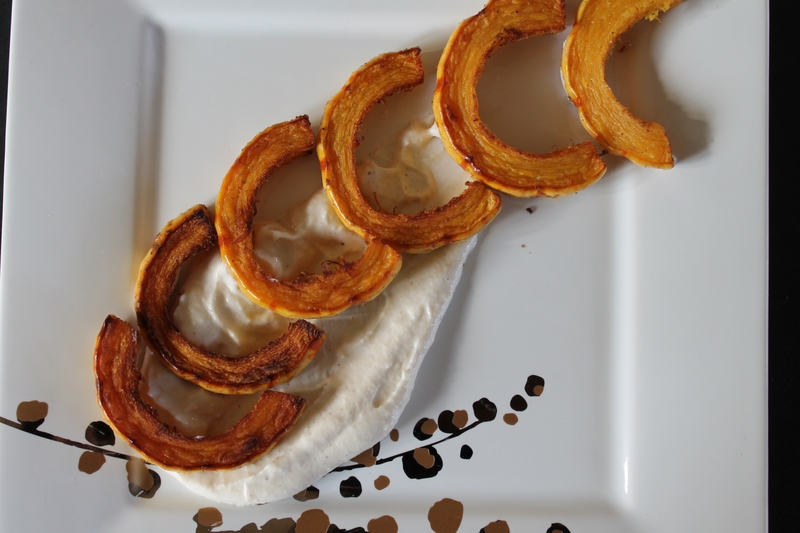 Serve the squash slices with yogurt dipping sauce. Thanks for posting this! I’m glad you liked them. Love the yogurt sauce, too. I have thought about substituting squash for sweet potatoes many times. This could be the year!! Great SRC choice. Oh mah gawd, girl – this looks awesome! I LOVE cardamom and recently have become a squash addict. I can’t wait to try this! This looks heavenly! It’s been a while since I’ve made delicata squash. I love how you can eat the entire thing, skin and all. I need to make this soon! That cardamom sounds like a great idea! I always forget how it adds a sweetness without sugar. 🙂 And roasting it with squash is just genius!